Hydrogen cars have been gaining steam recently with auto manufacturers picking them as alternatives to their battery electric options. Some companies are even creating their own versions. Researchers at UCLA may have found a significant upgrade that could streamline these vehicles even further. Their new device can efficiently and cheaply stores energy and produces hydrogen. Most of the electric vehicle industry is run on lithium-ion batteries. It’s the common choice alongside hybrids that use diesel fuel to extend range. Hydrogen fuel cells also allow one to drive longer distances, but that takes an entirely different infrastructure that’s well behind the momentum of battery charging stations on the road. Richard Kaner and Maher El-Kady may have found a solution to help streamline vehicles that run on hydrogen. Their new device feature the same positive and negative electrodes that hydrogen fuel cells have, but it also adds a supercapacitor as an additional electrode. That supercapacitor gives it an ability to store energy. These are all connected to a solar cell that can generate electricity and power the device. Harvested energy can be stored in the supercapacitor or it can be in chemical form as hydrogen after the device produces it. Kaner, professor of chemistry and biochemistry and the senior author of the study, said this advancement is similar to how smartphones offer a combination of calling, looking up information on the web, and using a camera. Hydrogen still has a bad reputation because much of it is still being converted from fossil fuels. If it’s not produced from renewable sources, then it’s not sustainable with the carbon footprint that process leaves. 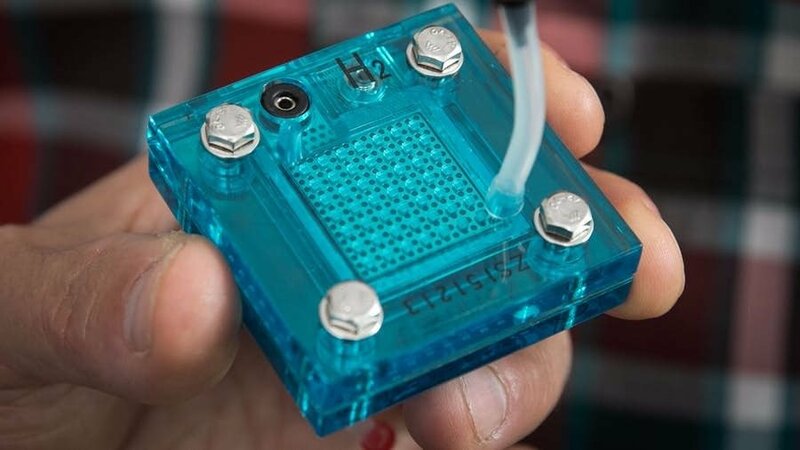 What’s different with this new device is it uses nickel, iron, and cobalt to produce hydrogen fuel with solar cells to power it, creating zero carbon emissions. Those materials are also much more common and at a fraction of the cost it takes for current hydrogen production. Being able to combine production and power with a single device will also cut back on expenses. While the prototype is very small, this could easily be scaled to fit the needs of a car that runs with hydrogen fuel cells. Another benefit of the new device is it could be used in large cities to store excess energy from electric grids. States like California already produce too much energy from solar panels and they’ve sold it to other states. This could be an additional and cheap way to store energy as utility companies have built battery backup facilities and pondered using battery EVs as storage.